Anthony R. Tersigni is president and CEO of Ascension. CHICAGO—Ascension has created a new position for a chief digital officer who will start later this year, the health system told Modern Healthcare on Monday during the American College of Healthcare Executives' 2018 Congress on Healthcare Leadership. The new executive, who will join the St. Louis-based system from a major publicly traded technology company, signals Ascension's increasing investment in its digital platform and its enthusiasm to meet consumer needs. Ascension CEO Anthony Tersigni would not yet name the candidate. The largest Catholic health system in the country is in the middle of a major restructuring that includes a reshuffling of its executives, new staffing models and compensation standards, downsizing its hospital footprint while adding to its outpatient and telehealth network, and bolstering its subsidiaries. The aim is to standardize its clinical and payment data across its 151-hospital system to reduce variation, increase efficiencies, better engage patients and arm them with more information. The chief digital officer will use troves of data to form a systemwide plan to harmonize clinical practices, unify the billing system and improve cost transparency, which Tersigni admits is not one of the system's current strengths. Currently only a handful of healthcare organizations have a CDO. Among them is Aaron Martin at Providence St. Joseph. Martin is a veteran of Amazon who has invested in projects like mobile apps that make it easier for patients to research complex medical information and a Fitbit-like system for kids to encourage them to exercise. When the title of CDO was first introduced to the industry, the executive was responsible for introducing basic technologies. The role has since evolved into a symbol of an organization's commitment to true digital transformation, especially when the leader is recruited from outside of the industry. 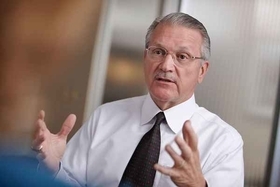 "We have been dabbling in a whole host of technological areas, but we need to create an overall corporate strategy around digital," Tersigni told Modern Healthcare, noting its virtual consultations with behavioral health specialists. "We have been doing it episodically, now we have to make it a systemwide strategy." Part of that strategy involves investing more in its ancillary businesses that brought in $150 million in additional revenue last year, Ascension Healthcare CEO Patricia Maryland told the audience at the Hyatt Regency during a session on cultivating qualified leaders. Some of its "solutions" arm includes its group purchasing organization, the Resource Group; its revenue-cycle management business, R1 RCM; its venture capital group, Ascension Ventures; and Ascension Holdings International, which focuses on international investment. "We can't just depend on our hospitals to carry us for the long term," Maryland said during the session. Going forward, Ascension will look to partnerships, mergers or acquisitions to direct care more efficiently throughout the continuum. It is actively working with housing agencies, social service providers and other community organizations to improve care in low-income neighborhoods, Tersigni said. "We don't need to control everything," he said. "What we need to do is collectively control the patient's experience along the continuum, that's what's important."